Can You Even Hike The Himalayas Anymore? 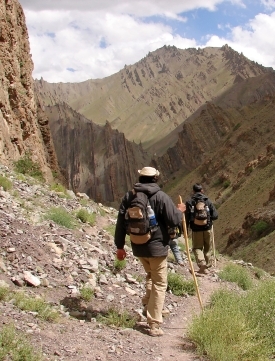 Open to the public since only 1974, the Ladakh region in the northernmost tip of India offers the rare chance for the seasoned hiker to trek amongst the world’s tallest peaks, at elevations ranging from 10,000 to 16,000 feet, as detailed in this article from the WSJ. Just an hour flight from New Delhi, this region is now one of the last remaining areas in the Himalayas where travel is even possible, given the political strife in Pakistan, Tibet’s bureaucratic jungle, Bhutan’s high tariffs, and Nepal’s increasing social unrest.